Contributing Writer: Kelly Griglione ~ Welcome Kelly our newest addition to the team, we are so excited to have her! You are going to love all of her eye candy cards that she will be sharing with us. I do love cards with puns, so it was fun to come up with this one for Father’s Day. Just a snip here and a snip there, and you have a cute vest for Dad. It’s so easy! So grab some paper, scissors, letter stamps and let’s get started! 1. Use the “paper snowflake” principle to make a template for your vest. Fold a piece of copy paper, draw a line for neck and arm holes, cut through both layers and open. 2. Trace this template onto the front of your card base. Cut the top layer for the neck (the back layer will be the shirt your tie is attached to) and both layers for the arm holes. Also trace the template on the back of your patterned vest paper. Cut. If you have an embossing machine you can emboss a texture on your vest paper to give added dimension. 3. 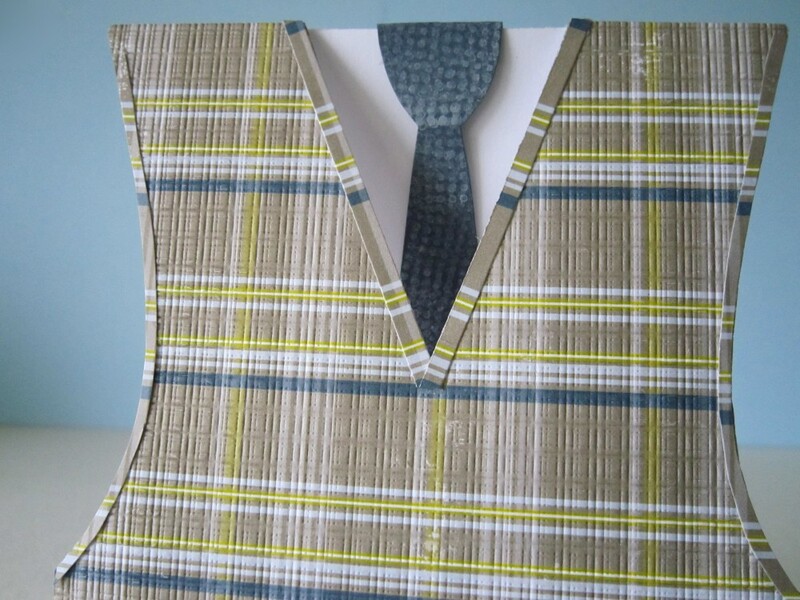 Slide paper for tie under the vest and draw a tie shape. This way you can get the right proportions because you can easily see what it will look like through the neck hole. Open card and finish drawing tie shape. Cut. Stamp with textured stamp if desired. 4. 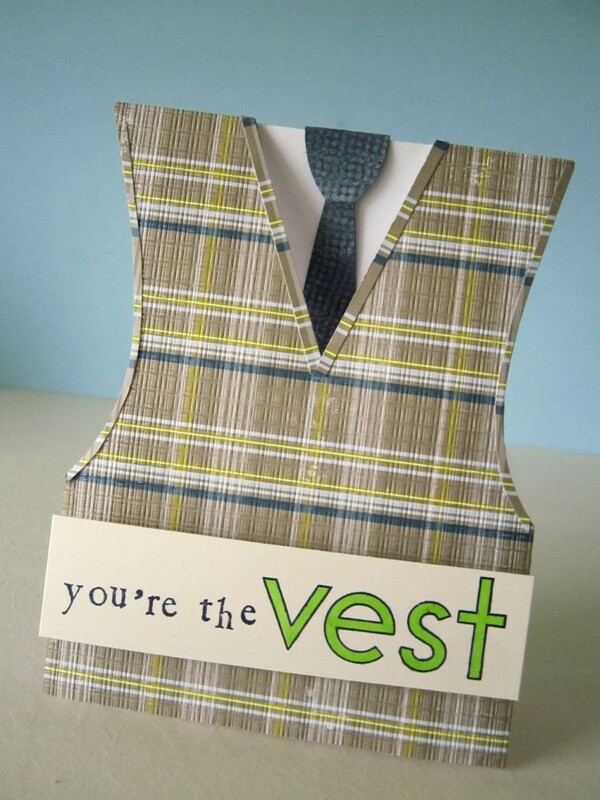 Adhere tie and vest to card. 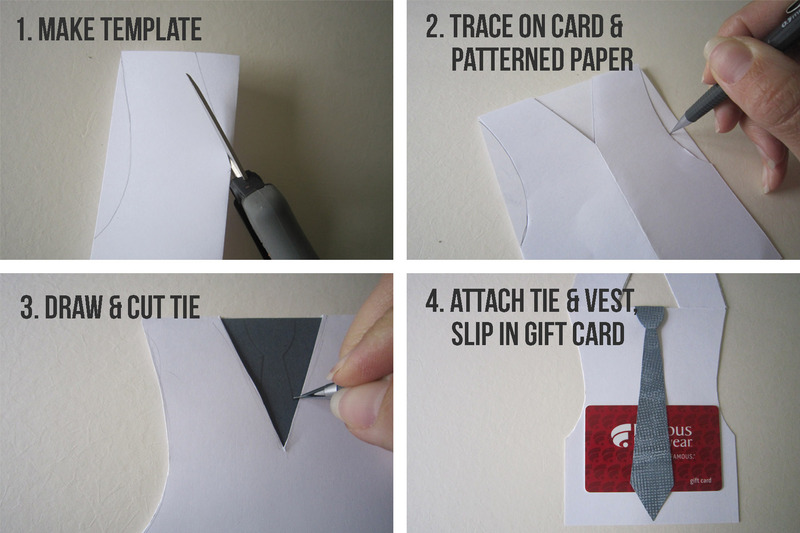 You can even use the tie as a gift card holder! Just adhere tie above and below the gift card, and slide the card through. 5. 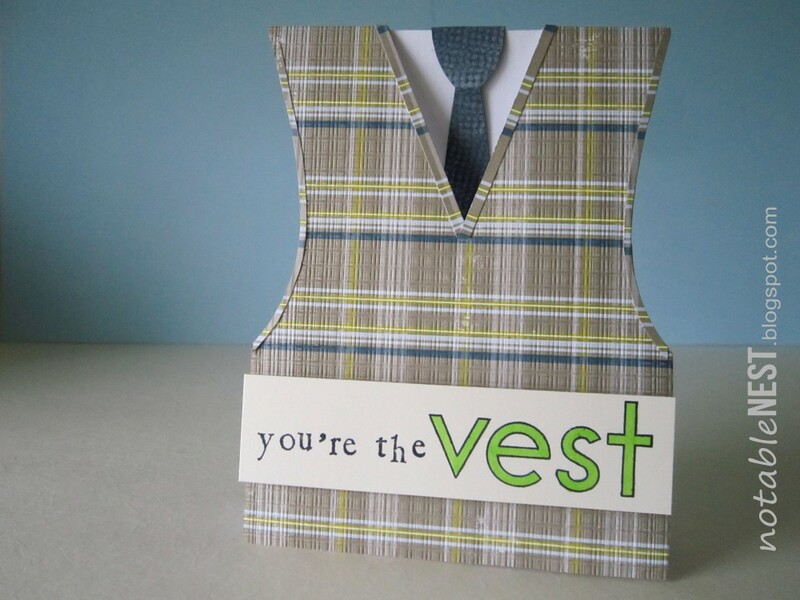 Cut a strip of beige cardstock and stamp your sentiment, using a larger font and different color for “vest” so the pun stands out more. Adhere to vest. OPTIONAL: 6. You can stop here, or cut thin strips of paper to make edging on the neck and arm holes. This gives a more realistic and finished look to your card. Once you’ve made one of these cards, additional ones are really quick to make since you already have the template made. I hope you give these a try! Cool card Kelly! Love the finishing details with the edging strips! Thanks JJ, nice to see you here! Great pun! Thanks for sharing! Thanks Les, it’s always a bonus when you can make someone chuckle with a “punny” card! Thanks so much Steph, glad you stopped by! This is the SWEETEST! You have the best fathers day ideas on your blog. Thank you for sharing, I love a good “pun on words”! Oh my goodness! This is so cool! What a great tutorial! We would LOVE for you to stop over and link this post up and any others in our Crafty Showcase. Our showcase runs from Sat-Thur and then on Friday our designers pick their favorite to be featured. This came out just too cute:) Loving the cute pun:) Thank you for sharing at Freedom Fridays. Have a very “vestest” week ever!